It is clear that Zagoravia has seen better days. The once prosperous city has fallen foul of a terrible curse, those that had a chance to flee for their lives leaving demonic creatures and the undead free to maraud its streets. It is a place that, as Victor Vran harrowingly explains in the game’s opening, darkness won and demon hunters had lost. It has been a year since hunters were first summoned to liberate the cursed city, and while many had answered that cry for help, none of those that fought back against the servants of darkness have returned. For Victor though, his motivation is more personal. When a raven delivers a message from his old friend Adrian pleading for his help, he journeys to Zagoravia and starts to search for him. 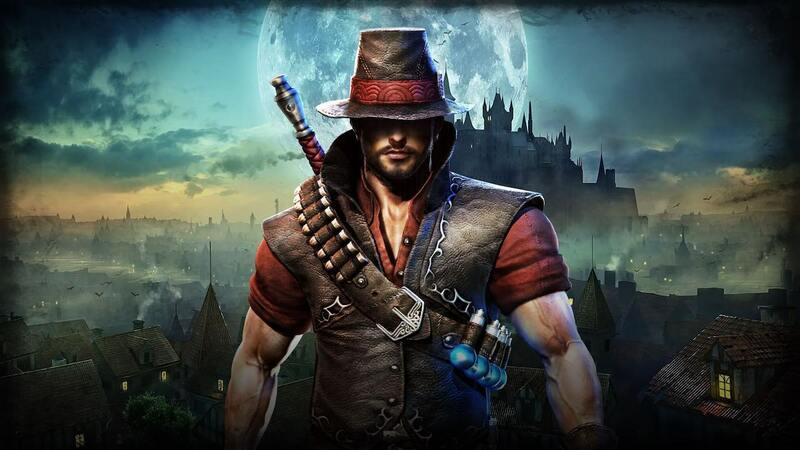 That is how your adventure begins in Victor Vran: Overkill Edition, an action role-playing game that, weapon in hand, will largely challenge you to slash, bash, gun down and fling spells in the direction of your otherworldly enemies in an effort to survive against the monstrous hordes that now occupy the city. Played from an isometric perspective, the experience does away with class-based characters to instead grant you the freedom to choose which two weapons Victor wields at any time – a design choice that lends the game its greatest strength. These can be broken down into melee (swords, hammers, scythes and rapiers) and ranged (shotguns, lightning guns, hand mortars and spell tomes) categories, resulting in a flexibility in approach that leaves the decision entirely up to you as to whether to get up close and personal or take out your enemies from a distance. Every weapon has three unchangeable attacks – one being your standard attack and the others being special attacks that have cooldowns – that you can use to fell your enemies, represented with icons that appear at the base of the screen. And, fighting to atone for a dark pact that he once mistakenly made, Victor also has access to demonic powers. You must gain Overdrive by killing monsters to activate these devastating attacks, that can soon sway battles back in your favour – whether that be raining down meteors, protecting yourself with a magical shield or teleporting to inflict status conditions. Whether dislocating skeleton jaws from their skulls as fight your way along otherwise eerily quiet streets, crushing spiders as they swarm around the royal gardens or shattering essences of fire that have left buildings burnt to a cinder, the game’s story progression soon guides you to the many isolated dungeons in which you will be challenged to see if you can handle everything that the developer has to throw at you. There are secret treasure chests to uncover, challenges to beat for rewards and loot to scoop up from fallen enemies as your work as a demon hunter racks up enough experience for you to level up. And it cannot be understated how important levelling your character is to the experience – not only helping to increase your health and the chance wield a second weapon early on, but later unlocking transmutation that lets you combine your weapons to make them stronger. Beyond that you can even change between outfits for different bonuses, flip through your Destiny Card collection that grant passive abilities when equipped or even use Hexes to make your dungeon battles more difficult but allowing your success to be met with greater reward. Between quests, you can teleport back to Castle Zagore, a safe haven where you can restock your health potions, spend your accumulated gold on more powerful weapons or place your gathered loot into storage to clear up some inventory space. You don’t have to play Victor Vran: Overkill Edition alone, either. One option is to let another demon hunter join your quest in local multiplayer, which is a painless process but will mean that the camera is locked so that you are unable to freely move away from each other’s location. And then there’s online multiplayer, where you can create or join a room with up to four players. With random players, you can expect inconsistency in levelling to lead to overpowered enemies and there was some latency in the ‘English’ room games that I played. Team up with friends and communicate over voice chat, and I’m sure that there is more than enough fun to be had together. With the recent news that Diablo III Eternal Collection will release on Nintendo Switch in the coming months, Haemimont Games will have cursed their luck. But, for those wanting to scratch that same itch, this Gothic-themed romp is easily the best alternative on the portable home console. Victor Vran: Overkill Edition comes packed with more than enough content to justify the price of admission, just don’t expect your demon hunting to be an easy ride.